Taking care of your awning is a year-round job, and it’s especially important to maintain your awning before the winter months. Taking care of your awning is a year-round job, and it’s especially important to maintain your awning before the winter months. Since the winter can put a great deal of strain on your awning in the form of wind, snow, freezing rain, and ice, it’s important to make sure everything is in good condition now and throughout the season. Here are our best winter awning tips that you need to know to keep your awning in great shape. First, you should make sure that your awning is completely clean. There should not be any dirt, leaves, or debris on top of it. If you are going to be storing it for the winter, you need to brush off every piece of lingering dirt or debris. Grab a soft-bristled brush to remove the initial debris. Then, you should use your hose and a gentle detergent to get rid of any stubborn spots or stains. Always follow manufacturer instructions to make sure you don’t damage the fabric. Next, you should give your awning a good rinse and then allow it to completely dry. If you fold up your awning while it is wet or in the process of drying, mold and mildew can grow and ruin your residential awning over the course of the winter. Even if mold and mildew don’t damage the fabric itself, they will lead to a foul-smelling odor when you unfurl your awning in the spring. Next, you should remove and clean the valance. Remove any debris and use soap to clean off any stains on the surface (following the same process as above). Allow the valance to totally dry and then store it away for the winter. Finally, you should retract your residential awning and tie it up for the winter months. If your awning isn’t retractable, you should carefully detach it from the frame, fold it up, and then store it in a dry place for the winter. 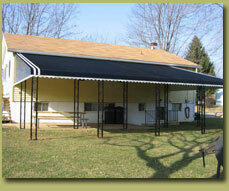 If your awning has a cover, now is the time to attach it.